Quogue Beach Retreat, 90 min from NYC! Relax on the newly renovated deck and patio or in the new saltwater pool after a day at some of the finest Hampton beaches. Bike to natural attractions, visit the nearby shops of Quogue and Westhampton, and enjoy fresh seafood every night! Or enjoy a late-night swim, soak in the hot tub and listen to music after a family BBQ. This 4 bedroom, 4 bathroom renovated home is pristine, bright, tastefully decorated and intimately connected with its natural wooded setting. Don't miss your chance to create life-long memories of summer and fall at the beach. We are located 3 miles from Quogue Village Beach, 2 miles to the dock, less than 2 miles to town and across the street from the nature center. My husband and I are transplanted native New Yorkers, who have enjoyed the beauty of the Hamptons for many years. When the opportunity finally arose to purchase our own place in Quogue, we did not hesitate. 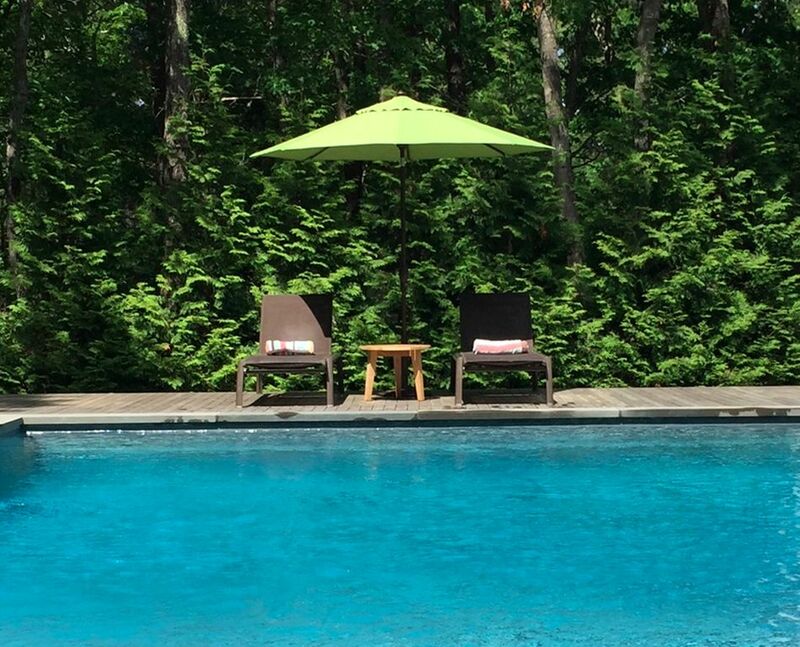 Quogue is a quiet village in a beautiful setting which is only 90 minutes from NYC. The surroundings are serene. Our home is a source of joy for us. It is bright and airy. The new pool is fabulous and enjoyable from within as well as on the deck. The landscaping is simple but pristine. The house has four distinct, private bedrooms, two with en suite bathrooms. When it is time to be together, the open concept great room boasts a comfortable stylish living room, dining area, and kitchen with two refrigerators for wine! There is a finished basement with finished full bathroom, TV, pool table and three distinct areas to accommodate extra guests. The home is perfect for both large and small families. Our perfect day is to bike to the beach with our children, take an afternoon swim in the pool or hike in the nature center, enjoy a family BBQ on the deck or indulge in a seafood dinner at any number of quality restaurants. The fall is also beautiful, with nearby farms and wineries that offer many activities for couples and families, alike. toilet, combination tub/shower, master bath with two sinks, clean lines in the shower tub. I cannot say enough about this quiet Quogue Beach retreat. In a small community--quiet and secluded--but close to everything! Minutes from the beach and town. Easily bikeable. Beach is fabulous. House is perfect for families. Two large masters. A room with bunk beds for the kids. Huge basement with rec room. The best thing about this house is the open floor plan between living room, dining space, kitchen and outdoors. Can easily keep an eye on kids in the pool while in the kitchen. Remodeled outdoor space can't be beat! We spent most of our evenings outside near the fire pit, pool, or hot tub. Owners are accomodating, flexible, and super responsive! We have stayed here 2015, 2016, and 2017 and will continue annually! This is an amazing house in Quogue, just an hour and half from Manhattan. The large saltwater pool is gorgeous and is surrounded by a huge deck with plentiful space for lounging, barbecuing and relaxing in the hot tub. The outdoor shower is luxurious! Inside the house was spacious, very clean and beds were extremely comfortable. There is a huge furnished basement with a pool table that the kids loved. The beautiful beach is a very short drive away but we were well entertained staying at the house on the deck by the pool. There are numerous shops and restaurants to enjoy in neighboring Westhampton as well. The owners were very gracious. We hope to return in the future! My family and I stayed at this amazing house last summer and were extremely happy with our visit. The property is centrally located on a pretty street in a quiet neighborhood which was great for going on walks with our baby. The open floorplan was perfect for entertaining – the public areas are spacious and comfortable, while the private areas are tucked away nicely. We have rented homes in the past where it seems like you and your guests are on top of each other. This house is the exact opposite and lends so well to hosting guests while maintaining your personal space and privacy. The house itself is modern, clean and well-maintained. The kitchen was well stocked with appliances and has everything you need. We spent most of our time outdoors, enjoying the pool and grilling, and loved every minute of it! The owners are respectful, responsive and a pleasure to work with. The house exceeded all of our expectations and we look forward to becoming regular guests! I stayed at this beautiful house in Quogue for three summers for 6-8 weeks each time. It is spacious, stylish very well kept, and a wonderful place to spend time with family. The owners are approachable and very responsive. While the beach is close by, one can be just as content to stay by pool and spa, which is newly renovated. The great room and deck is wonderful for bringing friends and family together. My family and I thoroughly enjoyed our time at 7 Park Circle and hope to be able to return again when the time allows. Thank you so much for your kind words. It is always a pleasure to have you! Utilities may be taken from security deposit. Beach pass to Quogue Village Beach not included.